Lansing’s Mid-Michigan Running Club knows how to beat winter: layers and good shoes. LANSING, Mich. - Mid-Michigan Running Club knows the obvious: running outside, during Michigan’s harsh winters, can be a challenge. And yet, the 1,975 runners who belong to the club, seem to find their way to keep training in the cold, mush and snow. Jennifer Quinlivan is one of the leaders of the Mid-Michigan Running Club. Every Tuesday, Quinlivan runs 2-7 miles with her group along Lansing’s River Trail. 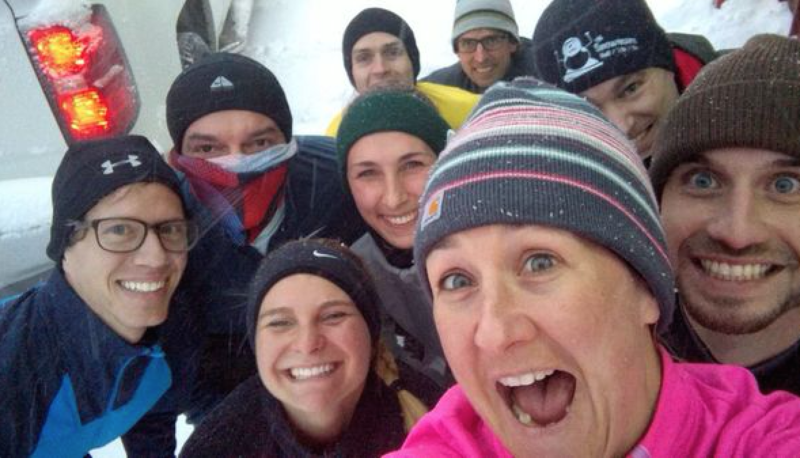 Members of the Mid-Michigan Running Club have a good time on their weekly training meet-ups. Winter weather calls for special running gear, specifically, more layers and different shoes. “We try to keep warm on snowy days and wear some air-tight shoes. These shoes have more grip than other shoes. At the same time, these shoes keep our feet warm. This will make it safer for us to run and less likely to fall,” Quinlivan said. The club, which was founded in 2099, was set up step-by-step. When it was first established, publicity was not an easy task for the club leaders. Today, they can be found on the app Meetup. “This club is a very good organization. I joined the club in 2010 when I moved from Colorado in Michigan. Since then, I run with the club every week. Earlier, we didn't use the Internet. We could only promote our club a small number of cities. Now we are using the Internet, more and more people are joining us. We didn’t have a lot of members in our club when we started but the number is increasing,” she said. Seth Maher is also one of the club’s leaders. He joined in 2017, and has been running for eight years. He’s used to running in the colder weather. “The group runs year-round in all sorts of weather. We very rarely cancel a run because of weather, obviously, nicer weather draws more runners to attend,” he said. The obvious question lingers: why don’t they just run indoors, where it is toasty warm and they won’t get wet. According to Quinlivan, that’s not on the table. “We never do indoor sports, nor do I like indoor running. Outdoors, we could breathe fresh air, at the same time, we enjoy different scenery. I never go to the gym. Weekly running replaces the gym,” Quinlivan said.